Orange Burr-Bush is an annual herb, about 1 m tall. Stem is hairless except for a single line of crispy hairs on purplish side of internodes, alternating at each node. Leaves are membranous, 3-5-nerved, ovate or ovate-lanceshaped, 5.5-7 cm long, 2-3 cm broad, with scattered simple hairs on both sides, pointed to long-pointed, coarsely toothed. Leaf-stalks are 1-2 cm long, hairy on upper side. Orange flowers are borne in 3-flowered clusters, about 1 cm long. 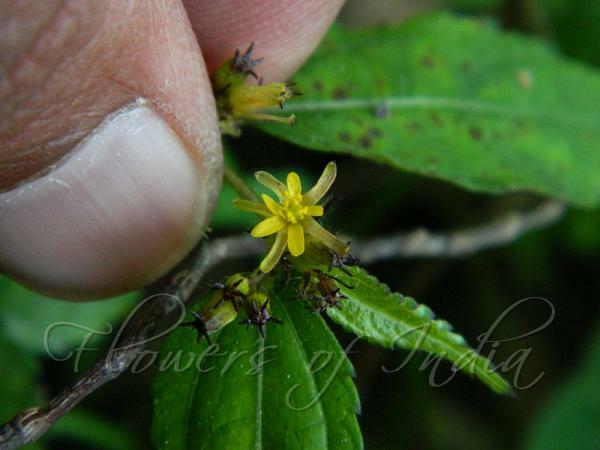 Flowers are about 8 mm across, carried on 3 mm long stalks, which elongate in fruit. Sepals are strap-shaped, hooded at the tip. Petals are spoon-shaped, slightly smaller than the sepals, blunt. Stamens are twice as many as petals. Carpels are 4, ovary spherical, 4-chambered, hairy, style equaling the stamens, stigma 4-lobed. Capsule is sphereical, hairless, about 1 cm in diameter including 4-5 mm long, conical spines. Orange Burr-Bush is found in Africa, Himalayas, India, Burma, Thailand and Malaysia, at altitudes of 1000-1700 m. Flowering: August-September. Identification credit: Gurcharan Singh Photographed in Chamba, Himachal Pradesh & Tungareshwar Wildlife Sanctuary, Maharashtra.